The company I work for is currently undergoing a process of “regionalization”: Several positions within the organization are being sent to Latin America, longtime employees getting laid off. The idea behind this is ostensibly to get better aligned with the cultural demands of each region and reach a wider audience. There may be some truth to that. But in reality, it’s just the way corporate capitalism works, where the bottom line reigns supreme. Why should a company stay at the level it’s at when it could be making more? Michael Moore, always the rabble-rouser, took this phenomenon and wrote a book called Downsize This! Random Threats from an Unarmed American in 1996. While on the road to promote it, he made this documentary in which he attempts to interview the heads of several companies in the process of eliminating staff. The encounters are largely unsuccessful but always uncomfortably funny, as Moore tries to explain why letting go of the people who made you successful is just absurd. 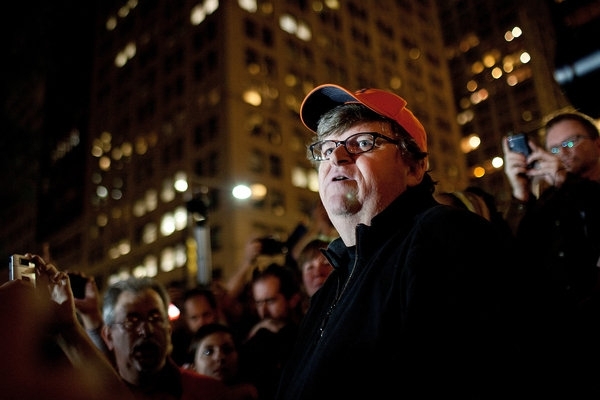 There’s no denying that Moore’s larger-than-life persona is as much a part of his documentaries as the subject matter. He’s a savvy entertainer, not only a social commentator. In terms of craft, The Big One is not at the level of his later efforts like Bowling for Columbine (2002) or his Oscar-winning Fahrenheit 9/11 (2004). But it’s lighter, specially during those moments when he connects to the “little people” in parking lots and radio stations. In the end, we’re left with the sober reality that corporate shareholders are in control, even though – as Moore jokes – the Constitution doesn’t mention them anywhere. Down with the empire! I’ll stop writing now before “they” come for me.